The art of restaurant skiing: when you’ve reluctantly ventured out onto the slopes and the snow is blasting at you horizontally, the obvious recourse is the welcoming shelter of a mountain restaurant. Or, when the sun has brought everyone out onto the slopes, and the queues for the lifts are just too long, where else to go, but a restaurant terrace with a wonderful view? If you are in the French Alps, you will no doubt have a glass of Savoie wine in your hand. Does this sound familiar to wine-loving skiers? Ski resorts are the life-blood of the small Savoie wine industry, which has less than 1,800 hectares of vineyards scattered from south of Lac Léman (Geneva) in Haute Savoie, down to the Isère Valley and Chambéry on the borders of the départements of Savoie and Isère. But, except in a few very smart restaurants in the poshest resorts, and those hideaway auberges known only to the favoured few, skiers rarely get to try the best Savoie wines on offer. These are reserved for a select private clientele and the better restaurants in the larger towns, like Evian, Thonon, Annecy, Albertville and Chambéry. 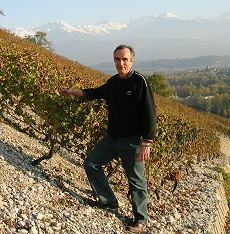 Right: Michel Quenard at Chignin. Let’s destroy the myths, first: 1) These are cool climate wines. Wrong! The French Alps could justly be described as the start of southern France, and the steep, sunny exposure of many vineyards ensures good ripening in most years. 2) These are high altitude wines. Wrong again! Whereas a few vineyards are above 500m, most are at altitudes not dissimilar to those in Alsace or the Côte d’Or, and only rarely does snow fall. 3) The wines are all rather neutral dry whites. Partly true: roughly two-thirds of the region’s wines could be described like this, but, the rest are a revelation!If you are a fan of obscure grape varieties, then Savoie is a must. White wines account for 70% of production and of that, more than two-thirds are from Jacquère, a low sugar grape, ideal to produce those delicate, ethereal whites. In the vineyards near Lac Léman, the Chasselas grape is used, as it is across the water in Switzerland. But the most interesting white grapes are Altesse, whose wines are confusingly labelled “Roussette de Savoie”, and Bergeron, which is none other than the Rhône’s Roussanne. Even more obscure are whites from the rather bland Molette in Seyssel; the relatively aromatic Gringet (from the Traminer family) in Ayze, near Bonneville; and even tinier quantities of so-called Malvoisie (probably Veltliner Rouge) and Mondeuse Blanche (confirmed as one of the parents of Syrah, no less!). For reds, Gamay is widely planted and Pinot Noir less so, but the real interest is in wines from the potentially spicy and rich Mondeuse (possibly related to Syrah, but probably not related to Italy’s Refosco as previously thought). There are red obscurities too, the most exciting of which is the Persan grape, enjoying a tiny revival. Incredibly (or not, if you know French wine laws) there are 17 crus that may be tagged onto the general Vin de Savoie appellation, covering the whole region. Roussette de Savoie is a separate appellation for 100% Altesse wines and has four further crus. Crépy and Seyssel have their own appellations (the former best forgotten, the latter good for sparkling, and fairly good Altesse whites). The largest crus, planted mainly with Jacquère, are Apremont and Abymes, but the wine quality is hugely varied and downright bad in some cases. For Jacquère, the crus Chignin, Cruet and Jongieux, offer an overall better quality level giving wines that are really refreshing as an aperitif, or to match any cooked cheese dish, like fondue, raclette or tartiflette. Note, Jacquère is rarely named on the label. 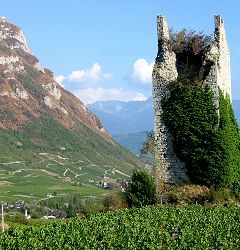 Chignin, a village that features four ruined towers in spectacular scenery, is the only place where Roussanne may also be planted on the best slopes (those on virtually solid rock suffered badly in the 2003 drought). These wines are named Chignin Bergeron and typical examples have an exotic, floral and fruit nose, sometimes waxy too. On the palate they can be extremely rich, if almost dry, and are best drunk with foie gras, or a dish with a rich sauce and some sweetness. A great local match is with farcement – a type of savoury ‘pudding’ made of potatoes, bacon and dried fruit, and served with pork. Roussette de Savoie wines have a structure not unlike a light Chardonnay. They should be dry, light to medium weight, and a very few are oak fermented or matured. Aromas can include yellow stone fruit and a delicate floral character. The lighter styles such as wines from the Frangy cru are good aperitifs, and fuller ones are a beautiful match for river or lake fish, such as trout, or the local Féra or Omble Chevalier. The best Roussette de Savoie cru is Marestel, a spectacular vineyard site in Jongieux, but increasing quality can be found in the Combe de Savoie vineyard area, from Chignin to Fréterive. The red Mondeuse grape also excels in the Combe de Savoie, especially in the Arbin cru, near Montmélian and parts of Chignin. Debates continue as to the best way to handle Mondeuse. For many years, to suit the thirst of skiers, the only style made was a light fruity one to be drunk within the year. Many producers are now working more seriously with Mondeuse, and achieving good results. With careful vineyard management and better control of yields they are able to produce a fruit quality and structure that can take either oak ageing, or sometimes, micro-oxygenation, to give a rich fruit-cakey style, with moderate but silky tannins. These are undoubtedly food wines and match with a hearty pork stew or local diot sausages and polenta (a Savoie dish, by the way, not Italian!). Few of these wines are exported, but here are some names to look out for if you have a chance to visit the region. In Chignin, there are a plethora of producers named Quenard. Choose André et Michel Quenard; Jean-Pierre et Jean-François Quenard, Raymond Quenard, or Pascal et Annick Quenard. In Jongieux for a range of wines, but especially Altesse and Marestel, try Edmond Jacquin et Fils, Dupasquier or Eugène Carrel et Fils. For Cruet and some good value Mondeuse, Domaine de l’Idylle is reliable (and imported to the UK by Yapp Brothers). Alexis Genoux and Louis Magnin are great choices for Mondeuse d’Arbin. For more serious, oaked and expensive Mondeuse, and a truly elegant, oaked Roussette de Savoie, look out for biodynamic producer, Domaine de Prieuré St-Christophe.